The Seagram Building (see The City Review article) is one of the monuments of modern architecture in part because it only uses just over half of its site. Almost half a century after its erection, somebody has thought what to do with that other half, or at least the unused air rights. That somebody is Aby Rosen, who owns the Seagram Building, and Lever House (see The City Review article) cattycorner across the avenue as well. 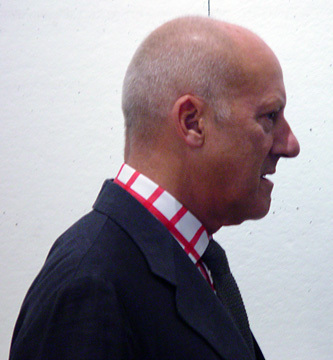 Mr. Rosen, an active art collector, commissioned Sir Norman Foster of Foster and Partners, whose stainless-steel-and-glass notched tower addition to the Hearst Building on the southwest corner of Eighth Avenue and 57th Street, is nearing completion, to design a tower utilizing the unusued air rights. 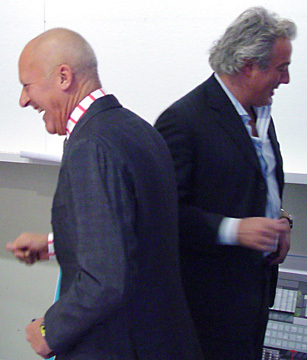 Sir Norman Foster is widely regarded as one of the worlds foremost "high-tech" architects and his famous projects include the Hongkong and Shanghai Bank Headquarters in Hong Kong, the Commerzbank Headquarters in Frankfurt, Germany, and the Great Court at the British Museum in London. He and Mr. Rosen and a slew of associates appeared before the city's Landmarks Preservation Commission November 22, 2005 for a declaration supporting an an application by RFR Realty LLC, Mr. Rosen's company, to the City Planning Commission for a special permit waiving setback and height regulations for the transfer of air rights from the Seagram Building, an official individual landmark, at 375 Park Avenue, which it owns, to an adjacent site at 610 Lexington Avenue for the erection of a 709-foot-high, mixed-use tower. In their presentation, they concentrated on the visual impact the new tower might have on the "iconic" view of the Seagram Building from across Park Avenue. From street-level in front of the Racquet & Tennis Club (see The City Review article) directly across the avenue, they demonstrated that the new tower would not be visible and from the 53rd Street corner it would only be slightly visible and not appear taller than the 515-foot-high Seagram Building, which, in fact, it dwarfs. 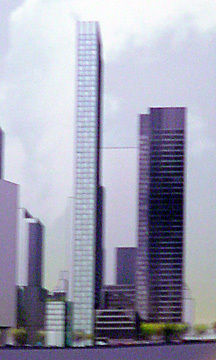 In a large model and numerous renderings, the new tower appears as an extremely slender and tall building with a light-colored facade and not setbacks. Sir Norman recalled that Mies van der Rohe, the architect of the Seagram Building, was focused very much on the "purity" of form and noted that the Seagram Building has a low-rise, mid-block "bustle." 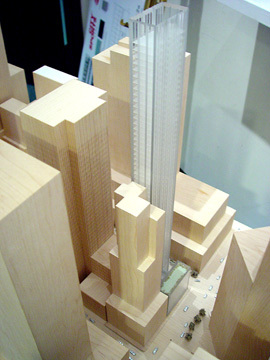 His new tower is setback 10 feet from 53rd Street and its "bustle" is a low-rise "pavilion" on Lexington Avenue, where it maintains the streetwall and has retail spaces and it is separated from the tower by an atrium with entrances to hotel facilities in the lower portion of the tower and condominium apartments on the upper floors. The new tower will be separated from the tower of the Seagram Building by about 117 feet. Sir Norman also argued that the most harmonious way to relate to the Seagram Building was by contrast and using a light facade. Although he said that final details of the facade was still being explored, he indicated that the current plan calls for a "faceted" approach, one that recalls to a certain extent the unrealized Frederikstrasse project by Mies van der Rohe. The plan for the new tower, therefore calls for "faceted" facades on the east and west facades. He said that the north and south facades, however, would be straight. The tower's dimensions in plan are very small, only 90 feet on the east and west facades and 46 feet on the north and south facades. 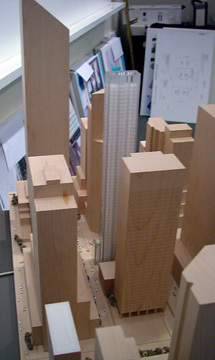 As a result, the new tower would only rise above the northern portion of the Seagram Building. While it was not discussed or mentioned at the commission's hearing, the light facade would obviously be in context with the 915-foot-high Citicorp Center (see The City Review article) that is cattycorner across Lexington Avenue from the new tower, and with the stainless steel top of the Chrysler Building (see The City Review article) further south on the avenue. (It could be noted that Sir Norman's stainless-steel facade bracings at the new Hearst tower pay a degree of homage to the diagonal elements at the top of the Chrysler Building.) Furthermore, his facade design would also to a certain extent be harmonious with the light-colored facades of Cesar Pelli's One Beacon Court, five blocks up the avenue. Mr. Rosen, one of the principals of RFR Realty LLC, said in an interview that the building will contain 80 to 90 condominium apartments and 45 to 50 hotel rooms. Mr. Rosen said that the new tower will only utilize about 90 percent of the available, unused air rights from the Seagram Building, which only occupies 52 percent of its site and is widely regarded as an icon of modern architecture. If the tower had been designed as-of-right, that is, within existing zoning and building regulations, and utilized all of its air rights, it could rise another 100 feet or so. Sir Norman told the commission that if the building were erected "as of right" it would be about 811 feet high, but he termed that scheme "not entirely successful." Mr. Rosen said that Hines, the Houston-based developer and real estate owner that owns the third property on the block, the 36-story, black-glass-clad tower formerly known as Manhattan Tower at 600 Lexington Avenue will be the construction manager for the new tower. RFR Realty LLC recently bought the mid-rise building at 610 Lexington Avenue, the former home of the YWCA, on the southwest corner of 53rd Street, cattycorner to Citicorp Center, which is 915 feet high. RFR also has developed 425 Fifth Avenue and are nearing completion of Park Avenue Place at 60 West 55th Street. Under the terms of the "74-79" application that will go before the City Planning Commission, the developers will pledge to restore and maintain the landmark Seagram Building and will establish a covenant with the New York Landmarks Conservancy, a civic organization, to that effect. Spokespersons for the Municipal Art Society and the New York chapter of the American Institute of Architects, told the landmarks commission that their groups supported it. A spokesperson for the Historic Districts Council, however, told the commission that "the new, enormous building" will have "a negative impact" on the Seagram Building and that her organization therefore does not support the project. Roberta Brandes Gratz, a member of the commission, remarked during the hearing that the new project was "quite exciting" given the horror of images of how wrong this could be," adding that the design "almost feels natural." The new design, however, is hardly "natural." 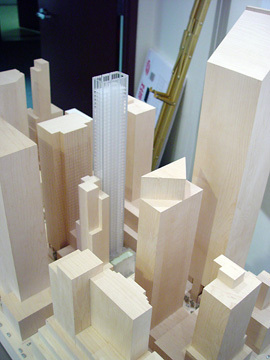 It will become one of the city's slenderest towers, a mid-block "sliver" almost without peer. Although the city adopted anti-"sliver" zoning sometime ago, it was aimed primarily at largely residential neighborhoods, and while it had the support of many neighborhood groups it was a conservative attempt to rally around the architectural flag of "contextualism," then very popular. The mood in the city has changed somewhat and in the past couple of years there is a growing constituency for somewhat more architectural daring as well as a growing "charm" with "celebrity" architects. Sir Norman is every bit the "celebrity" architect not afraid to wear boldly patterned shirts and ready at the drop of a t-square to wax poetic, and mellifluously, about form and the virtues of technology. He bears a slight resemblance to Gerhard Richter (see The City Review article), the painter. It will be interesting to see the final design. One suspects it will be elegant, a word that Sir Norman dropped several times during his presentation at the commission. Given the tower's slenderness, one is prone to wonder whether its "bustle" pavilion along Lexington Avenue will take away a bit from its drama and whether it should have a plaza at the corner, or, perhaps, mid-block. Given that 599 Lexington Avenue (see The City Review article), the blue-green tower has a very large and handsome triangular plaza directly across the street at the 53rd Street corner and that Citicorp has a substantial sunken plaza at the same corner and that Mr. Rosen, an active art collector, obviously is enchanted with beautiful buildings, one can most likely not worry about the project having a plaza. One thing is certain, the new tower will add significantly to the glamor and drama of Lexington Avenue even though the building it is replacing was a quite pleasant mid-rise structure. The tower's slender form really will not be "harmonious" with any of its neighbors, but that is not necessarily bad. This is a case where arguments could reasonably be made for different shapes, siting and colors, and Ms. Gratz was on the mark when she suggested that a lot of bad designs could be envisioned. 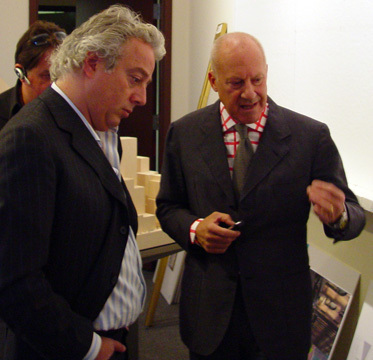 The commission unanimously approved a declaration in support of a special permit from the City Planning Commission, which will hold its own hearings on the project, and the commissioners were obviously delighted by Sir Norman as well as greatly impressed with the intent of the developers to give the New York Landmarks Conservancy a covenant assuring the maintenance of the Seagram Building in the future. 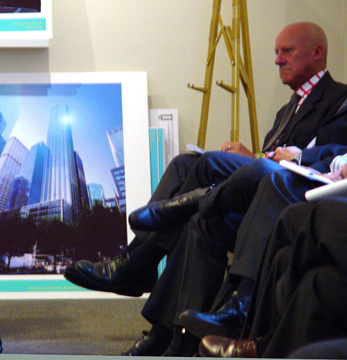 There was little discussion of aesthetics at the commission's hearing, which was a bit odd, but its decision to support the project is very encouraging and a bit a courageous given the anti-high-rise sentiment of so many planners and civic groups in the city over the past few decades, a sentiment that had it cropped up earlier would have deprived the city of the Chrysler Building, the Empire State Building (see The City Review article), 20 Exchange Place, 30 Rockefeller Center (see The City Review article), 570 Lexington Avenue (see The City Review article), and 70 Pine Street (see The City Review article), just to name the most obvious skyscraper glories of the city.